walled city of Delhi, was founded as Shahjahanabad by Indian Emperor Shahjahan in 1639. It remained the capital of the Mughals until the end of the Mughal dynasty. It was once filled with mansions of nobles and members of the royal court, along with elegant mosques and gardens. Today, despite having become extremely crowded and dilapidated, it still serves as the symbolic heart of metropolitan Delhi. The Masjid-i Jahan-Numa 'World-reflecting Mosque' , commonly known as the Jama Masjid of Delhi, is the principal mosque of Old Delhi . Jami Masjid, is a reference to the weekly Friday noon congregation prayers of Muslims, Jummah, which are usually done at a mosque, the "congregational mosque" or "jama' masjid". It unifies the diverse Indian culture due to which is fascinates tourists. To sum up all, it’s a chief part of someone’s Delhi Tour. Chandni Chowk is the major street in the walled city of Old Delhi, which was originally called Shah Jahanabad. Enjoy the Rickshaw Ride going through the narrow streets of Chandni Chowk Bazaar.Visit Spice market. Raj Ghat is a memorial to Mahatma Gandhi. It is a black marble platform that marks the spot of Gandhi's cremation on 31 January, 1948. It is left open to the sky while an eternal flame burns perpetually at one end. It is located on the banks of the river Yamuna in Delhi in India. It was originally designed to reflect the simplicity of Mahatma Gandhi's life. In recent years, it has become customary for foreign dignitaries visiting India to pay their respects to Gandhi at the Raj Ghat by laying flowers or wreaths on the platform. As a sign of respect, visitors are required to remove footwear before approaching the memorial. A commemorative ceremony is held every Friday. Prayer sessions are held at the Raj Ghat on Gandhi's birth and death anniversaries. New Delhi is the capital city of India. 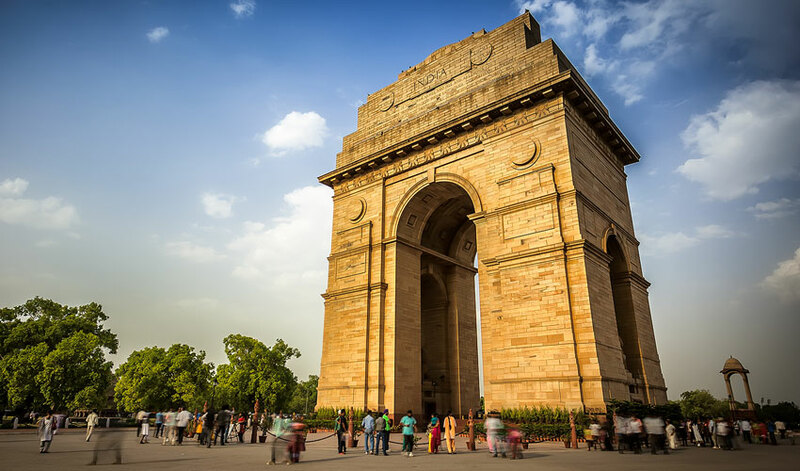 With a total area of 42.7 km2, New Delhi is situated within the metropolis of Delhi and serves as the seat of the Government of India and the Government of the National Capital Territory of Delhi (NCT).. The India Gate is the national monuone of the largest war memorials in India. Situated in the heart of New Delhi, India Gate was designed by /wiki/Sir_Edwin_Lutyensment of India. It’s an historical war memorial of those soldiers who were martyred to bring India its independence. It’s located in Connaught Place, New Delhi. The towering height of India Gate is 42 m which makes it the choicest tourist destination. It’s a great place for excursion which you’ll commemorate for a longer period. Visit the Parliament House &Preseident’s House from outside and click some pictures. Humayun's tomb is a complex of buildings built as the Mughal Emperor Humayun's tomb, commissioned by Humayun's wife Hamida Banu Begum in 1562 CE, and designed by Mirak Mirza Ghiyath, a Persian architect . Today, Humayun Tomb promotes Tourism in Delhi to a greater extent. It is considered as a must see tombs of Delhi. A great craftsmanship, coupled with incomparable Indian architecture, revivifies your entire Delhi India Tour. The intricately chiseled stones of Humayun Tomb compel you to commend them.